Meet your neighbor Marcques Derby of Burlington, Iowa. Marcques is the son of Dave Derby and Kris Nisius. His father lives in Dubuque, Iowa and is a department manager at Wal-Mart. His mother lives in Raritan and is the manager of Riverland Wireless in Monmouth. Marcques was born in Burlington, Iowa in 1986. He graduated from B.H.S. in the class of 2004 and attended Southeastern Community College for two years. Marcques has two brothers and two sisters. Sister Christina Gilpin, 32 and her husband Bill live in Burlington, Iowa. Christina is a teacher at Burlington Community High School and Bill works for the city of Burlington. They have two children, Clayton, 7 and Brock, 3. Sister Melissa Derby, 30 lives in Dubuque, Iowa with her daughter, Cassandra, 7. 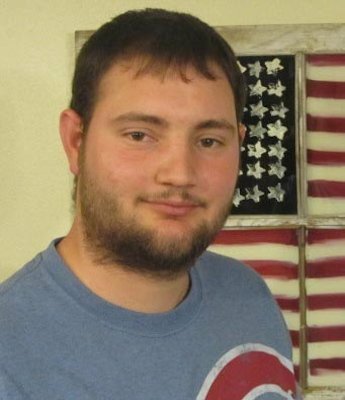 Brother William, 21 lives in Raritan and works at Lance in Burlington, Iowa. Brother Andrew, 25 lives in Monmouth with his wife Jessica and their two children, Aiden,2 and Marjorie, 1. His grandparents are Howard and Mary Derby of Burlington, Iowa and Larry Bernhart. Marcques has worked at Case New Holland for the last 6 months. He previously had worked at Mediacom for 3 years. He married his high school sweetheart Ashley Kienast on August 18, 2007. They will be married for 5 years this year. Ashley works at Casebine Credit Union. Marcques' biggest accomplishment is owning his own construction company, MJD Construction. His favorite vacation memories are going to Chicago in 2008 on Military Leave and watching the Chicago Cubs win at Wrigley Field. He also enjoyed White Water rafting in the gorge in West Virginia in 2009. Marcques is a member of V.F.W Post 10102, the N.R.A, ABATE of Iowa, and the D.A.V. He is a veteran and served in Iraq from 2007-2009. Marcques enjoys golfing and watching the Cubs win! !